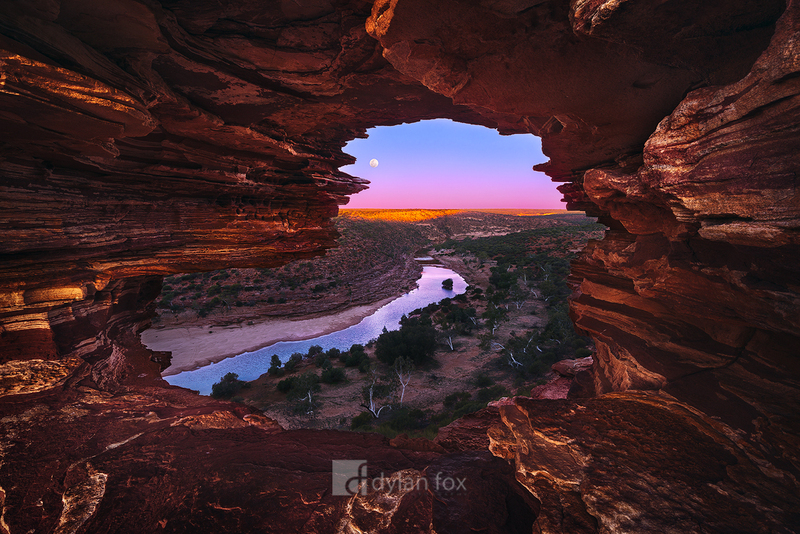 One of my most memorable and most popular photographs is of Nature's Window in Kalbarri National Park. It was taken on a morning I will never forget. That was a sunrise photograph. Since then, I had been wanting to shoot a full moon through the window at twilight. I had been thinking about it for quite some time, and could very clearly imagine what the result would look like. After some planning on when a full moon would line up with the windows view and when the skies would hopefully be clear, I made the trip up to Kalbarri with high hopes. The weather forecast was perfect for what I wanted and knowing the location well, all I needed to do was be there. I had been assured that the road into the park was open. It was being sealed but access would be possible at this time. When I arrived at the road entrance I was greeted by a road worker who said access to the park closed at 4pm. It was 4:30pm at this stage. I managed to talk my way past him but I ended up being turned around by the site manager. I was gutted. Everything had lined up except the appropriate sites mentioning it would actually be closed at certain times. That 6 hour drive back to Perth the following morning was a long one. 2 months later I was back for another attempt. The weather this time wasn't looking great. It was set to be raining on the night I had planned to shoot. So I made the drive into the park the evening beforehand, just incase the following night didn't work out. I am glad I did. The moon sat the in windows view for so much longer than I expected. The icing on the cake that I hadn't planned for was the last rays of sunlight on the distant gorge walls. What an awesome evening! Secure your limited edition, Nature's Window print, 'Frame My Fantasy', by selecting your desired print size in the menu to the right.